Dennis Farina was a Chicago cop, working as a consultant on cop movies, when he got the acting bug. His first major role: playing a Chicago cop. He proceeded to have a distinguished acting career with some classic films and television series among his credits, including “Midnight Run”, “Get Shorty”, “Saving Private Ryan”, “The Mod Squad”, “Police Story” and “Law and Order.” But he also made no secret of his love for the Chicago Cubs. He didn’t just play an avid fan alongside Dennis Franz in the play “The Bleacher Bums” for a few years. He lived it. In 2006, he narrated the Cubs documentary “Wait Til Next Year” for HBO. He also contributed to the film “This Old Cub” in 2004. And when he came back to his hometown of Chicago, he made the pilgrimage to that shrine on the North Side. Because Dennis Farina was a Cubs fan. Unfortunately he passed away before the big win of 2016. He grew up in Maywood, the son of postal workers, and he always loved one sport more than others… “I had a wonderful childhood, and it all centered around baseball,” he told Cigar Aficionado. “Baseball was my sport. I started out in the outfield, but I wanted to be part of the activity all the time, so I put on a few pounds and I became a catcher. That was my position, because I always loved being involved.” And who did he root for? The Cubs. He had a favorite player too. “I grew up wanting to be like Ernie Banks. I was always imitating his hand movements on the bat.” When Franz became an actor he joined the Organic Theater in Chicago. “We did play after play, and after we’d finish one, we’d talk about what we were going to do next. One of my friends from that time was Joe Mantegna. Joe lived near Wrigley Field, and we were all big Cubs fans. Joe suggested doing a play about Cubs fans and the mentality of Cubs fans. 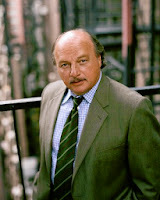 The play was about accepting the Cubs for what they are and loving them regardless, knowing that we will probably never see a World Series in our lifetime.” That’s Dennis Franz. And that’s a Cubs fan. The play may no longer be relevant after the 2016 series, but at least Dennis Franz got to see them win it once before he was gone. Carmen Fanzone is a guest for the Minutia Men podcast, which you can hear here. Great stuff about the Cubs (last segment of the show–starting around the 27 minute mark). Lew Fonseca can be heard in the montage of early Cubs radio announcers below.